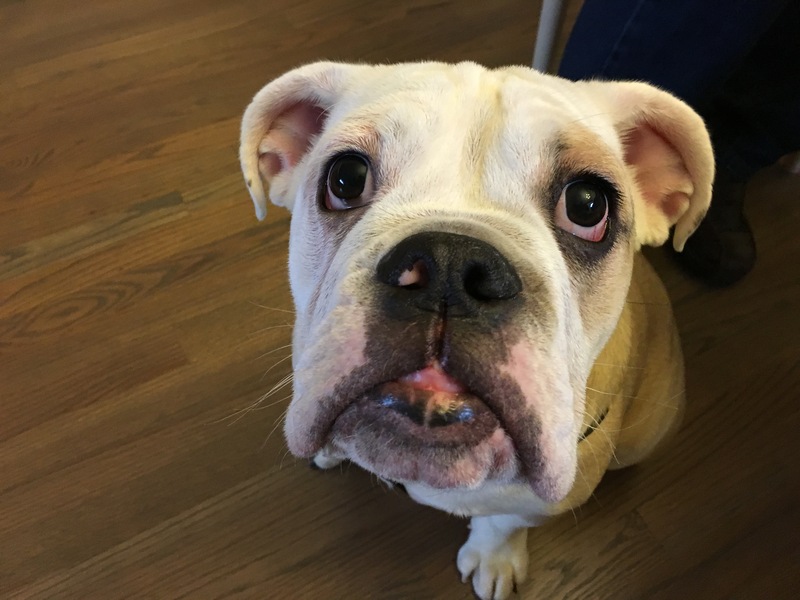 Leon is a six-month-old English Bulldog who has some excitability and control issues; jumping up on people, showing no respect for their personal space and anxiety when he isn’t allowed to do as he pleases. This is especially the case when he spends the day at his guardian’s parents house. There Leon wants, er demands to play with their eight-year-old Miniature Schnauzer mix Theo. Problem is Theo isn’t the most dog friendly dog. So having an excitable pup constantly rushing and barking at him wasn’t the ideal situation for anyone. When I sat down with the guardian and her parents to discuss this situation, it quickly became clear where some of Leon’s unwanted behaviors came from. Because the humans were petting Leon when he was in an unbalanced state, they were essentially reinforcing the exact behavior they called me in to stop. It will be important for the guardians to consistently disagree with Leon’s unwanted behaviors with good timing and appropriate intensity for him to learn that his actions are not desired. Petting him with a Purpose will go a long ways towards conditions Leon that he needs to do a desired behavior to get a human’s attention from now on. Because he is still a pup, I spent a few minutes stressing how important proper socialization will be for the next six months. Puppies are pretty fearless and you want to take advantage of that trait and expose the dog to as many situations, people and animals as possible. The more experience his guardians can pack in before the dog’s first birthday, the more confident and well adjusted he will become. It was great to see how quickly the dog adopted these changes. Within a matter of minutes he went from jumping up or mouthing the humans in the room to sitting and looking up at them politely to get their attention and affection. While many people think Bulldogs are a low energy breed, thats not always the case and certainly not the situation with Leon. I always want to ensure that a dog is getting he proper amount of exercise before I start addressing fixes. In many cases, unwanted dog behaviors are a result of pent up energy. When you have a puppy, the energy is going to come out somewhere. Either you can decide where this happens or your dog can. From my experience, dogs usually don’t come up with the most constructive ways to burn their excess energy when they are inside. Because the walk is a great way to burn exercise and can help define the leader follower dynamic, I suggested we head out for a short walk. Leon’s guardian told me he was challenging due to his penchant for wandering all over and getting the leash tangled up. I puled out a Martingale collar and showed the guardian how to add the special twist to the leash to stop his pulling and giver her more control. After a little indoor practice and going over the rules I use for a structured walk, we headed outside. Because the guardian was giving the dog so much leash and not providing much direction, he was under the impression he could go anywhere he pleased. While its ok for a dog to wander around and sniff on walks, I wanted to show the guardian how to add structure and discipline to help augment a healthy leader follower dynamic. At first the guardian was pulling back on the leash, correcting too late and stopping when the dog did which is why I took the leash halfway through the video to show her how to correct the dog the second it starts to get out of position. Because the guardian was waiting until the dog was completely out of position before starting to correct, she wasn’t getting a good response from Leon. After we stopped filming the above video the guardian took the leash again and as we continued her technique and timing improved. The more than she walks the dog in a structured way, the better they will both get at it. Just like anything else, practice makes perfect. After we returned to the guardian’s parents home, I went over some non verbal communication cues that she can use to disagree with Leon’s unwanted behaviors. Just like the leash corrections, it will be important for her to refine her technique and most especially her timing to get the best results from Leon. One dirty dog behavior secret is to disagree with a dog before it does the thing you don’t want. This requires careful observation. Because most people cant maintain that level of attention, I suggest that guardians recreate situations that their dog struggles with so that they can practice when they can give the dog their full attention. Once you successfully disagree or reward a dog with good timing enough, it starts to modify its behavior to match. So biting the bullet and setting aside 10-20 minutes a day to practice for a week or so can pay huge dividends down the road. Before we brought the other dog into the equation, I walked the guardian through a Leadership Exercise I developed a few years ago. The exercise helps the human practice the non verbal communication cues and the dog gets to develop its self control and focus. I suggested that the guardian and her boyfriend practice the Leadership exercise multiple times a day for the next week or two while gradually making it more difficult. This will help the dog develop more self control, a skill that will greatly improve his social skills. Now that Leon was calm and we had practiced multiple ways for him to develop self control, we were ready to bring the dogs into the same room. At the start of the above video, its clear that Leon was dealing with some intense anxiety due to my blocking him from running over to the other dog. One thing I neglected to make clear in the above video was why I was blocking Leon; his anxiety and unbalanced energy. Just like humans, dogs prefer to not deal or interact with someone who is showing an anxious or unbalanced energy. My goal was to have Leon in the room with the other dog Theo, but at a distance that allowed Theo to feel comfortable. This extra distance also helped Leon settle down faster as the target he wanted to interact with wasn’t close enough to interact with. By the end of the session, Leon was laying down completely calm on the floor next to me as Theo laid on the floor on my other side, also calm. Because we took our time, Theo was confident in my control of the situation so he mostly ignored Leon. Its going to take multiple visits to the guardian’s parents house to practice this exercise of both dogs in the same room, but apart from one another. The more exposure they have to one another under a controlled setting, the better behaved Leon will be. As Leon develops more self control, Theo should become more comfortable with his presence. Once that is the case, the dogs should be able to be in the same room in a calm and balanced way.